The excitement of a classic Broadway musical reaching the stage at Baltimore's Hippodrome Theatre. “Fiddler on the Roof. Actually, my mom was asking if we could go see it,” said Maria Smaldone of Greenmount West. Marred during the intermission when a man shouts 'Hail Hitler!' and 'Hail Trump!' from the balcony before security could show him the door, as captured in its aftermath by a cell phone in the audience. Police reported that when they arrived at the scene and approached the man at the theater, who was identified as Anthony Derlunas, they noticed that he smelled of alcohol and he may have been intoxicated. 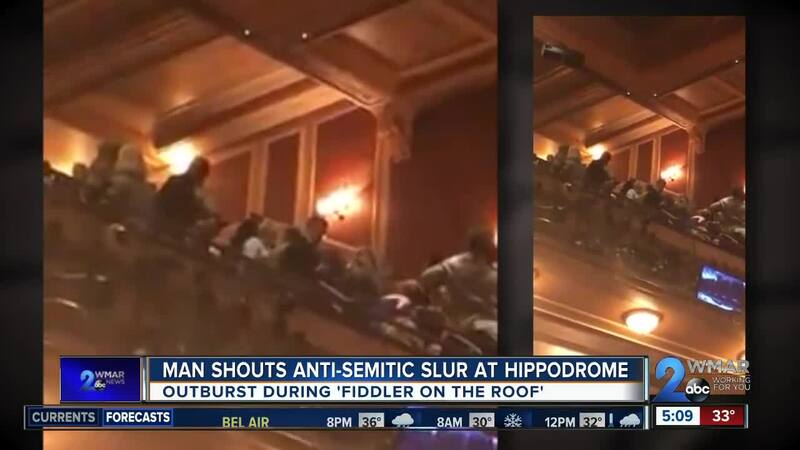 The executive director of the Baltimore Jewish Council, Howard Libit, equated the outburst to yelling 'fire' or 'bomb' in a theater. According to police documents, in an interview with the Delunas, he told them that the final scene before intermission reminded him of his hatred for President Donald Trump which caused him to stand up and yell his statement. He later told officers that his intention was to express his dislike for President Donald Trump. And after noticed that those around him became angry because "he didn't realize that there were so many Trump supporters." “Given the sensitivity of everything that's happened in the last couple of weeks—-the horrific shooting in Pittsburgh, the horrific shooting at the country western bar in California, I was trying to put myself in the place of the people in the audience there and you hear something like that shouted and you think, 'Is the next thing there's going to be gunshots? '” said Libit. “I'm glad the person was maybe taken out or asked to leave,” said Lucy Donofril of Hampden, “It's definitely not okay to make people feel like they can't enjoy a production regardless if they're Jewish or not." This incident comes on the heels of the racist graffiti found at Goucher College this week and the Ku Klux Klan flyers that turned up in Anne Arundel County over the weekend. There is a call for parents to do a better job educating their children and to use existing laws to try to address such incidents.